Thanet council Cabinet members have voted to move forward with a new option on the Thanet Draft Local Plan which will see 2,500 homes allocated to the villages, Margate and Westwood instead of the Manston airport site – but also strikes out both the policies (SP05 and EC4) in place to protect aviation. RSP hope to bring aviation back to the Manston site via the DCO being granted by government. However, their submission of a DCO, made in April, was withdrawn in May in light of issues raised by the Planning Inspectorate. It is yet to be resubmitted. A planning application for housing, business and leisure at the Manston site has been lodged by landowners Stone Hill Park. Tonight (July 2) the plan was brought back to the table with the option of approving the same draft previously rejected in January or going forward with an option aimed at retaining aviation at the site. But the wording of option2 has caused concern amongst aviation campaigners and many councillors who are in favour of bringing the airport bck into use. There was some confusion in the Chamber about whether the EC4 policy would be amended until council officer Adrian Verrill confirmed it would be deleted. This means it will only be effective until a new plan is adopted. Cllr Bambridge also said the pair would fight plans for extra houses in Westgate “every step of the way” and that the homes, and those proposed for Birchington – amounting to 1,600 homes on top of those already allocated – should be moved to Cliffsend instead. UKIP councillor Derek Crow-Brown said backing option 2 would mean putting forward a local plan that was not sound and would lead to judicial review – meaning the plan could be legally challenged. 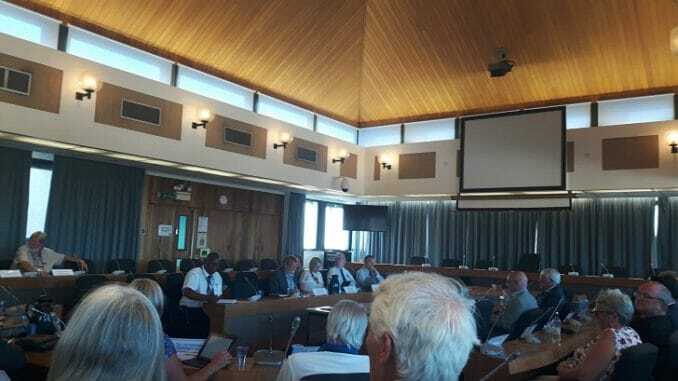 Council leader Bob Bayford said issues could be looked at when the plan goes to the council scrutiny committee on July 11 before going to a full council vote on July 19. If the plan is voted through there will be a six week consultation before it is submitted for public examination. The three Cabinet members present at the meeting, including Cllr Bayford, recommended the draft plan with option 2 to go forward to the scrutiny panel against officer recommendations for option one. The plan also includes a policy to introduce a temporary ban on new foster/residential homes for children being created in Cliftonville West where there are more than 6 people -including carers – on the premises. Aviation campaigners say they are not happy with the wording of option 2, saying the replacement ‘text’ will carry little, if any, weight in planning law. Those who are backing Stone Hill Park’s plans for housing, business and leisure say the new option effectively mothballs the site – which SHP own – until the end of the new local plan on 2031. Thanet District Council is in ‘intervention’ with the Government closely monitoring progress due to the authority’s failure to put in place a local plan. If Thanet District Council fails to publish a new plan, there is a risk of further direct intervention, such as the government or Kent County Council drawing up the isle’s blueprint for housing, business and infrastructure. Why on earth can’t the councillors who voted for option 2 see that the sensible choice is the one which allocates a couple of thousand new homes to the former Manston airport site? Because we are more desperate for jobs.. Not more people and homes.. SIMPLY the actions of the councillors have resulted in 1000’s of additional houses at Birchington, Cliffsend and so on. Marva, there are not enough jobs for those living here at this time!! South East England NEEDS ITS OWN AIRPORT. Please give some reasons why “South East England NEEDS ITS OWN AIRPORT”. It should be obvious. LHR, LGW AND STN are Pax airports. To build another runway at LHR would mean the demolition of many, many houses etc. Manston already has a runway, if you had not noticed! I worked at Manston for just short of thirty years. I KNOW that there are problems with “things” still buried there. Do you think it would be a good idea if somebody was drilling deep down to lay a foundation for a building or hardstand, if they were blown up by a WW2 unexploded bomb? When “they” carried out a dig a while ago, it was only for small explosives that had been buried in order to stop the Germans landing invasion gliders. That is all. Manston’s Airport would alleviate the aforementioned London airports from needing to accommodate Freight Aircraft. It has already been stated that there would be no scheduled night flights. However, you may or may not realise that if an aircraft needs to land urgently, it has to land! They cannot just park somewhere in the sky and stop there. I don’t know what a Pax airport is. Have you actually read any of the expert reports into the viability of Manston? Most freight goes as bellyhold in pax aircraft. Most freight (of any description) goes to the hubs of Heathrow, Stanstead and East Midlands, because that’s where the infrastructure, the freight handlers and the forwarders are. Dedicated freight has been on the decline since 2000, and there is over capacity for such freight at Stansthas and East Midlands. Davies ruled out Manston as an alternative to r3 at Heathrow early on in his deliberations. Ad I said earlier, aviation isn’t going to work at Manston. Get a grip of reallity. Have a bit of common sense. It would be far from great for people living under the flight path. Clearly not. If southeast England needed its own airport, Manston would still be there, supported by the 100,000 of people who flew from it every week. The fact is, too few people living east of the Medway chose to fly from Manston. So it wrnt bust, several times. Davies, Avia, Falcon, York can’t all be wrong. Face up to facts; acknowledge reality: there is no airport at Manston, and is unlikely to be. Andrew. The real reason why it failed is because those who started did not have the funds for one thing. Also one of the Companies had too few aircraft for the destinations they planned to fly to(Seven aircraft for about eleven routes). It took only one aircraft to go U/S and the whole system was in trouble. This is not the case with RSP (RiverOak Strategic Partners). RSP have no money and no planes. The only experience they can claim is that of Tony Freudmann, the struck off solicitor, who is an expert at failing airports. I’m not sure the argument for more jobs is very strong. The level of unemployment in Thanet IS slightly higher than the national average. But over 90% of eligible adults are actually in work. Mostly, I suspect, because wages are so low so labour is cheap. Many will be looking for semi-skilled work whereas many of the airport jobs would require some kind of experience or qualifications. So there really isn’t a great pool of suitable workers here in Thanet just waiting for an airport to give them work. I suspect that many airport workers for a Manston airport would come from elsewhere in Britain and would come looking for houses to live in. (Houses round here are a cheaper option than Gatwick or Heathrow). Dare I suggest it, but some of the necessarily qualified workers might need to be brought in from the rest of Europe! As an example of all this, the Building Employers Federation openly state that, for the UK to build anything like enough houses to meet present need, thousands of immigrant workers would need to move to Britain to fill the jobs as Britain just doesn’t have the numbers of qualified young adults to meet the need. An airport would be the same. I speak as a former supporter of Manston airport. Keefogs. With the new Brexit events etc. It is much less likely that Migrant workers will be allowed in to this Country to work here. Because it never had the right investment. This will now happen with RSP. In the past, Manston lost huge amounts of money. £10,000 a day when it closed, £100,000,000 in total. For a while, it ran under the guiding hands of Tony Freudmann, the struck off solicitor, the chap whocis currently a director of RSP. It’s wrong to say that there wad no investment in Manston. KCC, in addition to paying Mr Freudmann megabucks as a consultant, also invested £600,000 in launching a new route from Manston to the USA. Not one flight ever took off. You think RSP has the money to invest in the Airport? Thr Planning Inspector doesn’t think so. One of the PI’s concerns (one of several, so serious that RSP withdrew their application) was that RSP couldn’t show who had the money, and where it was coming from. The freight side at Manston never lost money. It is that side that RSP (RiverOak) propose developing first, followed by the new passenger terminal, etc. Manston passenger services were never managed efficiently in the past, but in the right hands it could be a really successful airport. If the DCO is accepted, RSP will own and oversee the Manston Airport project, but won’t manage it. We should all know something before the end of the month. Ron, you do not know what you are talking about!! Several of the expert reports say that were Manston to reopen, it could regain a freight business about as successful as before: ie losing £10,000 a day. The expert reports all say that dedicated freighter aircraft is not the way most freight is handled. It gies in the belly hold of passenger aircraft. It goes to hubs such as Heathrow, Stanstead and East Midlands. Dedicated freight traffic is in decline, had been for a decade, and there is plenty of spare capacity at Stanstead and EM. How correct is that. Freight from Manston at a capacity to make the airport viable is pie in the sky..Its gone its finished lets move on . I wonder if the thousands of people who want Manston Airport to return (in greater splendour than before) will outnumber the thousands of people who don’t want houses near them. I thought that the vote in January was lunacy. This really takes the biscuit. How on Earth can it be right in any sense of the word for a rightful owner’s plans to be mothballed for 15 years? It’s completely bonkers. Mad. Kafkaesque. Bizarre. These people, the ones who voted on this idea, against Officers’ advice, are charged with administering Local Government on our behalf. They really, really are not fit for purpose. Not all of them, I hasten to add. My comments are aimed at the spineless Tories and the witless ex-UKIPers. It’s quite alarming to think that people of this ilk can make decisions that impact on our lives for years to come, and they haven’t got a clue. One hopes that the SoS will step in pdq before too much damage can be done. The government needs to step in soon as these lunatics have taken over the asylum. They have no idea whatsoever what is needed in Thanet and just cannot understand the harm they are doing to the area. They keep stating that it’s what Thanet’s electoral wants !! It isn’t what the majority wants, just a bunch of protesters who mainly don’t even live in Thanet. Yes, we do need homes for residents already waiting but with these councillors voting for option 2 they will now be built in places you don’t want them because there is nowhere else to put them. These councillors going against the better knowledge of the officers and the professional reports on the councils behalf will just hold Thanet back for year and years to come. Their games are a disgrace. We need them ousted now before this blighting of the area becomes reality. It needs a government Audit team to come in to TDC and sort the incompetent council out. So much damage has been done to the isle by so many useless councillors its now time to stop. The intelligent frustrated councillors are brow beaten by the idiot councillors and some of the officers who have there own agendas . A new religion seems to have been adopted by many local councillors. Its name is “Manston Airport at any cost”, and its acolytes like all fanatics have no common sense and no empathy with others unless those others agree with them. And you have common sense Marva ? ? A feature of the Manston debate is that those who would see a return to aviation put forward arguments such as “Airport Airport “, or, occasionally, “Aquifer Aquifer “. On the other hand, those facing reality quote demonstrable truths and verifiable facts. Which of these two most closely align with your idea of “common sense “, Mr Sherwell? “Manston” is becoming a bit like “Brexit”.In both cases , a vote was taken (narrowly opting to leave the EU, or to elect a Thanet Council committed to retaining an airport) but, now,as the reality of actually arranging this becomes clearer, it turns out that all the promises of future success being easily achieved were pipedreams. Again, in both cases, the local and national politicians responsible are clinging to the results of votes taken some time ago to insist that “the people have spoken” so that they blunder on with their own versions of what they call “the voice of the people”. Situations change. The truth emerges. We discover factors that were hidden when we made the original decision. At what point, in both long-running, embarrassing sagas, will enough people and politicians call a halt to proceedings in the light of new evidence?